This large and spacious, traditionally furnished property is located in a small, quiet alley off Phan Dinh Phung street, Phu Nhuan District, just off Hai Ba Trung and close to the Tan Dinh Market. The three story property comprises 4 en-suite bedrooms, with two living rooms, one on the ground floor and another on the first, and two large roof top terraces. This 3 story, spacious townhouse is located in a quiet, peaceful alley in the heart of District 1, HCMC, close to the downtown shopping areas, restaurants and bars. Recently refurbished, the house is light and airy with a large, fully fitted kitchen and living area on the ground floor, with a separate parking at the front of the house. 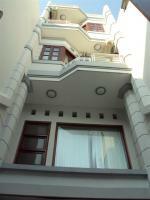 The two floors above each house two en-suit bedrooms with the front bedrooms also having balconies. The fifth bedroom is located on the top floor of the property, which is shared with a large rooftop. Near international school and Saigon riverside complex. located in the quiet dead end street just off Vo Truong Toan street..
Balconies off each level - 2 small and 1 large, a full big modern open kitchen, parking area for motorbikes and cars and a small garden. Headlining the next installment of Supersize Saigon on May 26 are godfathers of Chinese rock PK14 supported by Bad Neighbor. And on the decks in the Blue Room will be highly rated American turntablist Jayceeoh. Get ready for one hell of a show. Just when you thought Supersize Saigon couldn’t possibly get any bigger, the godfathers of Chinese rock, P.K. 14, are returning to the city that they left in shock and awe in 2009 to headline Vasco’s Yellow Room on Thursday May 26. Property of the week HCMC this week brings you a great find a short 10 minute motorbike ride from District 1 or Phu My Hung. A spacious 2 storey fully furnished apartment spread over 270sqm that has 5 bedrooms, 5 modern bathrooms, two with bath tubs. A full modern open kitchen with gas hotplates and ample storage space. A large rooftop balcony on the second floor for stargazing in the evenings. Uninterrupted views over the surrounding neighbourhood with ceiling to floor windows to allow ample natural lighting in during the day. Dylan in Vietnam - Part III: The Press and the "Idiot Wind"
In Part I of this series I pointed out the extent to which the press has portrayed Dylan's history, and particularly his political history just so damn wrong. Well, it's only gotten worse, much worse. If one were looking for symbolism in Dylan's first concert in Vietnam, one wouldn't have to look any further than the venue itself. RMIT University, located 20 minutes from downtown Saigon in Ho Chi Minh City's District 7, is a spanking clean campus of hip modern architecture and well manicured lawns surrounded by the coffee shops and housing that would typify any small university community in the developed world. For environmentalists in Vietnam, reminders they face a near impossible task are everywhere. However, one particular group expected an Old Quarter bar to be a safe haven. 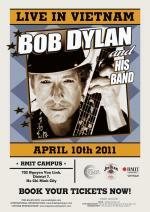 Bob Dylan is set to play a concert at RMIT University in Saigon on April 10. In the early press for the concert it was billed as part of a tribute to Trinh Cong Son, "Vietnam's Bob Dylan", who died ten years ago. The announcement of Dylan's concert has made headlines, which, it is hoped. will help sell out the 8,000 seat venue in Ho Chi Minh City's District 7. Interestingly, most every article which has appeared attempts to connect Dylan in some fashion to the movement against the war in Vietnam, screaming headlines such as "Anti-War Bard to Perform in Vietnam"
The UN-HABITAT Urban Youth Fund will this year provide one million dollars to projects led by young people aged 15-32 years who are piloting innovative approaches to employment, good governance, shelter and secure tenure. Small development initiatives are eligible for grants ranging from $5,000 to $25,000.